Villagers panic as massive fish heavier than a bus washes up on beach – Kenyatta University TV (KUTV). All Rights Reserved. A 21-tonne whale shark was discovered yesterday and the reported length and weight exceeds those currently on record. 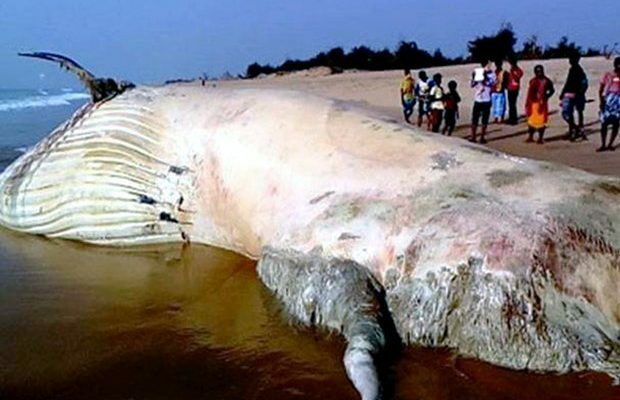 Stunned beach-goers found the huge carcass — which is a whopping 42 feet long and 28 feet wide — on the shore in Baidhara Pentha in east India. And according to the Guinness Book of Animal Facts and Feats, the largest whale shark was 41.5 feet long, 23 feet wide. That was found off the shores of Pakistan in November 1947. A forest ranger in India insists the dead creature is heavier than the one in the record books. Achutananda Das, who has been involved in the beast’s recovery operation said it was rare. “It’s a rare whale shark mostly seen in the Pacific Ocean. Cause of death can be ascertained after the post-mortem examination,” Das said. Specialist vets are to conduct an autopsy to determine the cause of death and if it is indeed a whale shark.